As soon as you create your account, you will be heading over to our Rummy Lobby. The top of the lobby displays information about your username, practice chips, Available Balance in your account, Provision to add cash, and details about your bonus points and Loyalty Points. At the bottom, you have tabs and sub-tabs to play rummy game that you like. Games available under cash game are those games which you can play for real money. The cash tab displays three rummy 13 card rummy variants game wise namely, Points, Deals, and Pool Rummy. Rummy Games are listed under each sub-tab based on their stakes – from low to high. To make it further easy to locate the game you want to play we have provided a filter using which you can sort your games based on stakes. The sub-tab contains further information like the active players and the number of players playing rummy online on each table. All the players need to do is to click on Join button to start playing rummy games. Players can check the tournaments that are available by clicking this tab. Furthermore, the tab contains 5 sub-tabs about the tournaments available at Deccan Rummy – Free Rolls, Cash, Depositor Free Rolls, Loyalty Freerolls and Special Tournaments. These Sub-tabs would list the tournaments available under each section and also contain information about the tournaments like the Prize pool, Number of Players, Registration/Tournament timings, and buy-ins. Clicking on the details will display the tournament structure and prize pool distribution. Just click on join and confirm your participation to play the tournament. 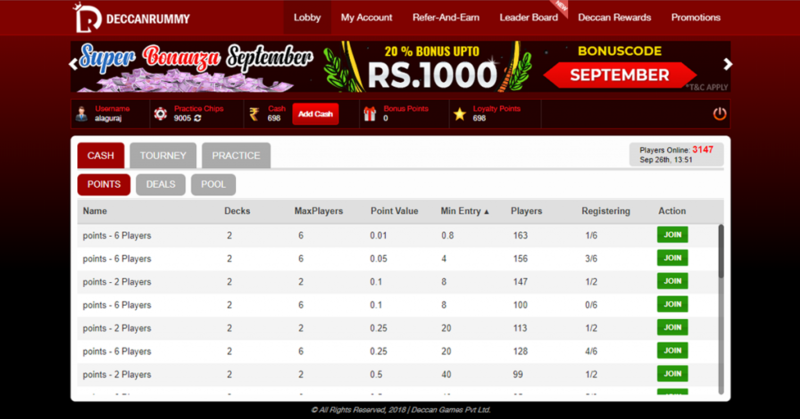 Practice tab displays the practice Online Rummy games that you can play for free at Deccan Rummy. Players who create an account with Deccan Rummy get 10000 practice chips in their account. Just like cash tab Practice tab have 3 sub-tabs games wise, namely 13 cards Point Rummy, 13 cards Deals Rummy, and 13 cards Pool Rummy. These games can be played with practice chips instead of real cash as the idea behind this to get a good grip of the game. To make it further easy to locate the game you want to play we have provided a filter using which you can sort your games based on the number of practice chips. Hope this article about rummy lobby was informative. Should you have any doubts with regards to this topic, feel free to post a comment below.